Because the Wingfoot HP was developed to be Goodyear's lowest priced all-season performance tire, good performance and appearance at a low price was its goal. 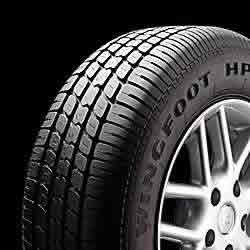 The Wingfoot HP's independent block tread design provides good handling and responsiveness, while its tread compound provides all-season traction in light snow and a long tread life. The Wingfoot HP's S-speedrating is a good indicator of the durability and dependability it receives from its polyester cord body and and two steel belts.